“I like my job from the beginning. I enjoy cooking. The person that encouraged me to cook was my father, Stanley. Whenever I would prepare my food, he would see the uniqueness in it. He would always appreciate it and would tell me, ‘you have made a nice and perfect meal.’ So that one encouraged me so much,” says Suzan. 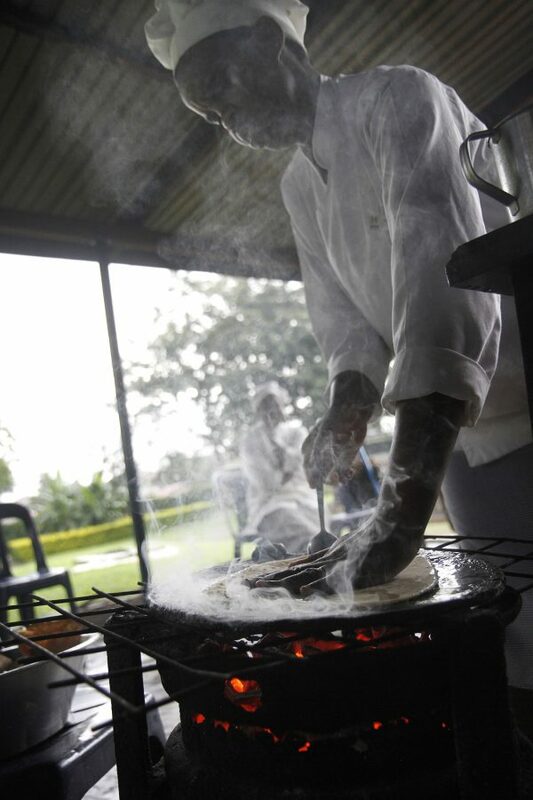 Suzan (pictured above) is one of the head cooks at CURE Uganda and has been with the hospital for 18 years. In 1998, she got her professional start at Mount Elgon Hotel, where she worked for 2 years and 9 months before starting at CURE. At the time, the hours appealed to Suzan. She was raising young children, so being home at night was important to her. 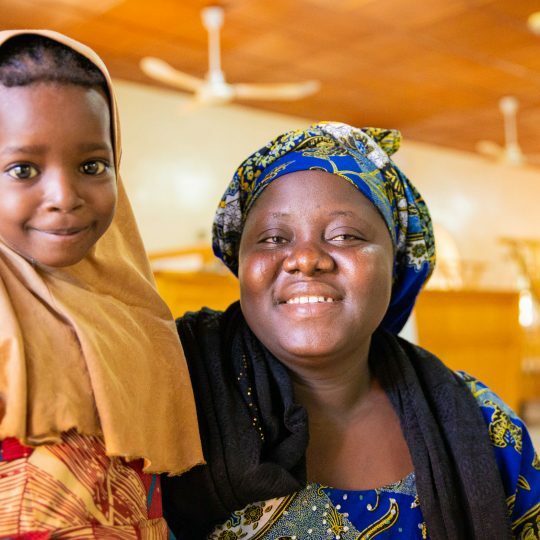 During her 18 years at CURE, Suzan has been able to minister to people through food. Suzan and Getrude serve lunch. “Using this job to serve my God… I look at people who are hungry; feeding them, I know this food will give them strength. Sometimes, when somebody is hungry, they tend to be with gloomy faces. They can’t be happy when they are hungry. If you quote Jesus, when He had stayed with the people three days preaching, they told them to release them to go home. He said, ‘No they are hungry. We should feed them.’ So, I feel food is important,” says Suzan. 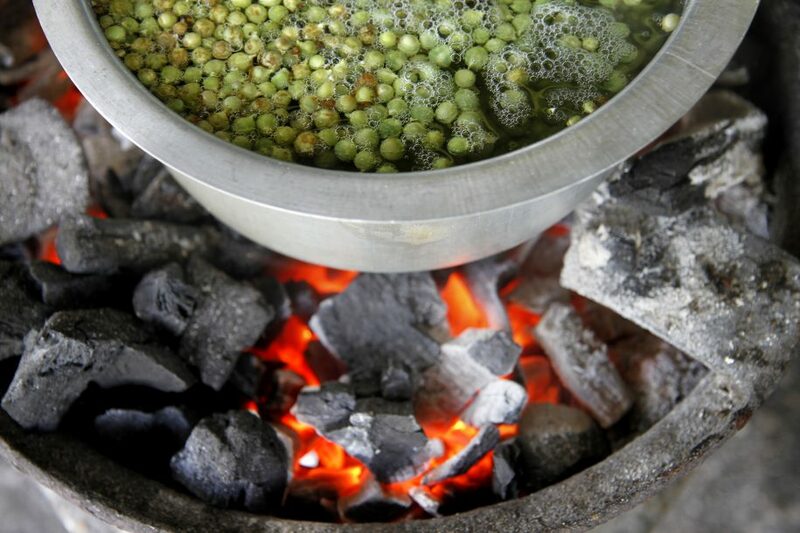 A pot of peas boil as they cook on coals. “I was willing to learn. I was not a caterer, but I was willing to learn,” says Shedrack. Shedrack has been a cook at CURE for the last year and a half after transferring from working part-time in the laundry department. “I wanted a permanent position. I wanted to learn more things because it can help me even at home.” says Shedrack. 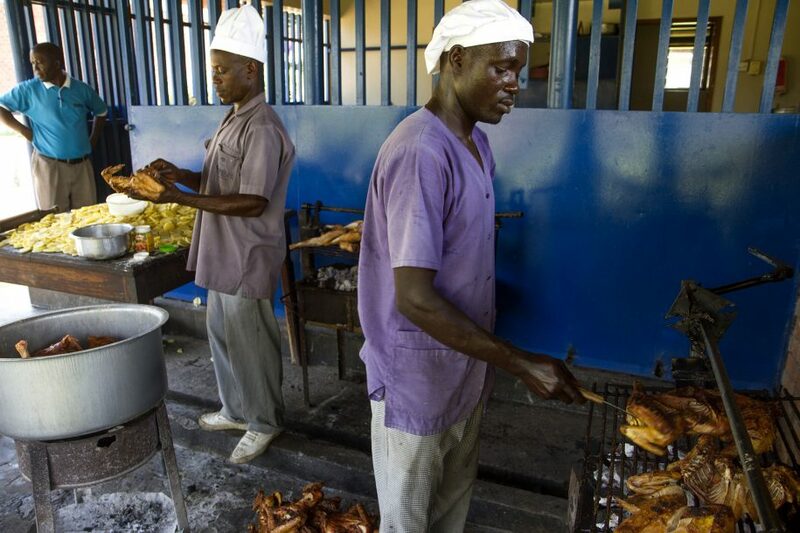 Shedrack and Godfrey prepare chicken for a staff event. He was working at Wash and Wills Hotel just down the road from CURE when he first learned about the hospital. Today, he uses his position to minister to the families in the ward. 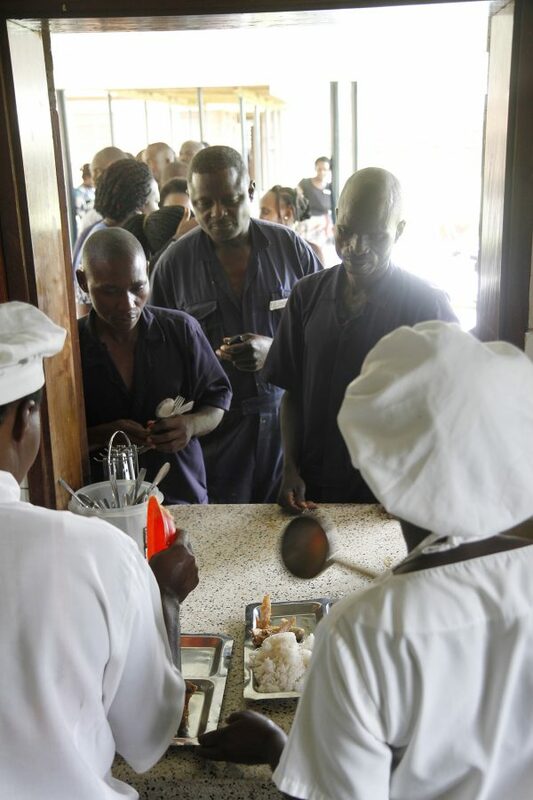 When families come to the kitchen for Formula 75 and Formula 45, which are milk formulas to treat malnutrition, he ministers to them by sharing about the goodness of Jesus. “We need spiritual and physical things,” says Shedrack. “I decided I wanted to cook because I enjoy eating good meals. I want to eat good food,” says Getrude. She has been cooking for CURE for the last 16 years. Getrude became interested in CURE because it is a Christian organization. 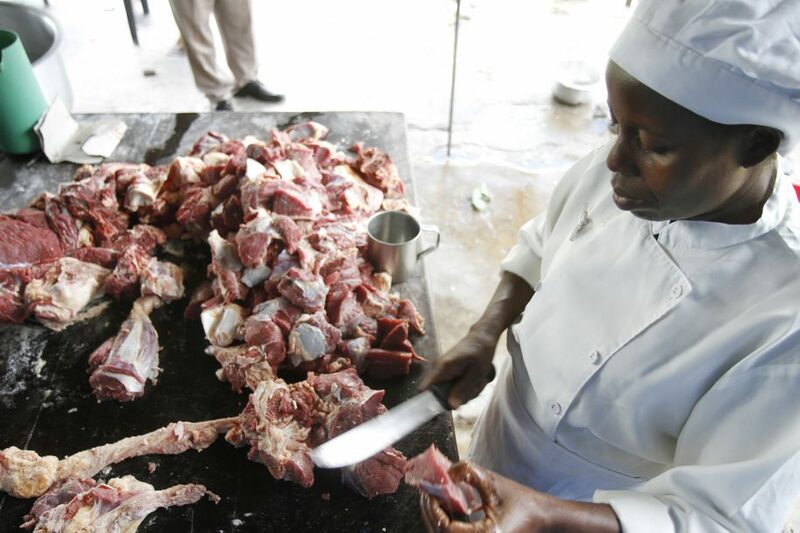 Getrude cuts over 46 pounds of beef. Every other Wednesday, the staff and families at the hospital get beef for lunch. “Here they give opportunity to serve. You can preach. It is free. When you are working in other places, they can’t allow you to do such,” says Getrude. 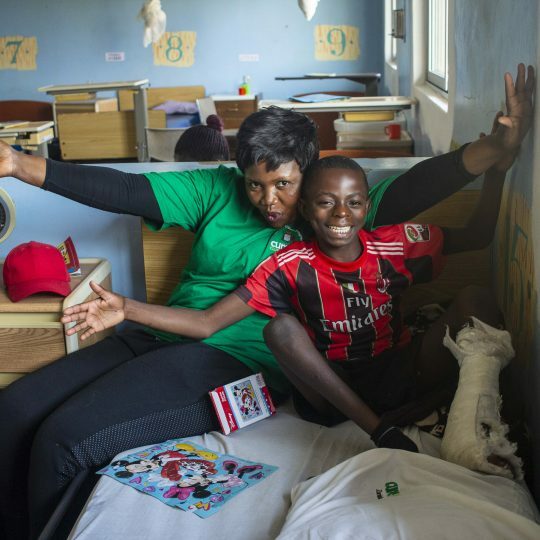 “Here, they even give you skills, how you can serve God.” Getrude has put some of those skills to use comforting mothers and, sometimes, witnessing to them. Getrude mingles a pot of posho. 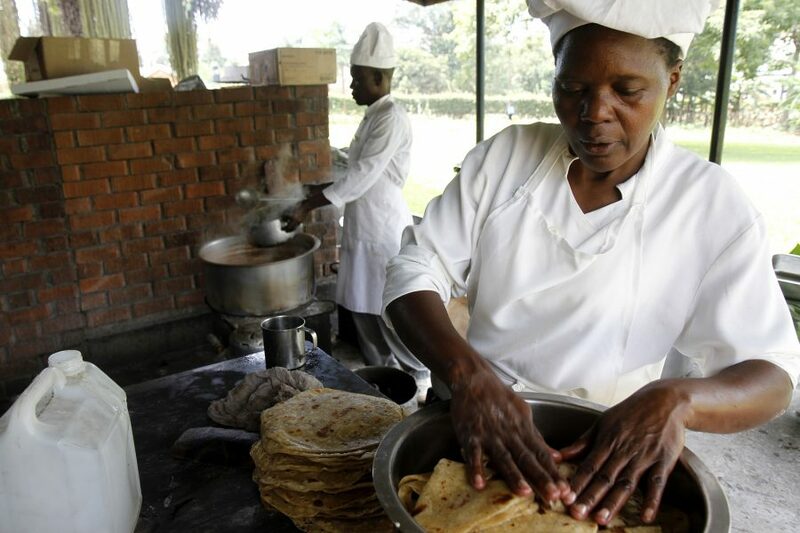 “At first, I didn’t know how to cook chapati, as I was practiced myself. 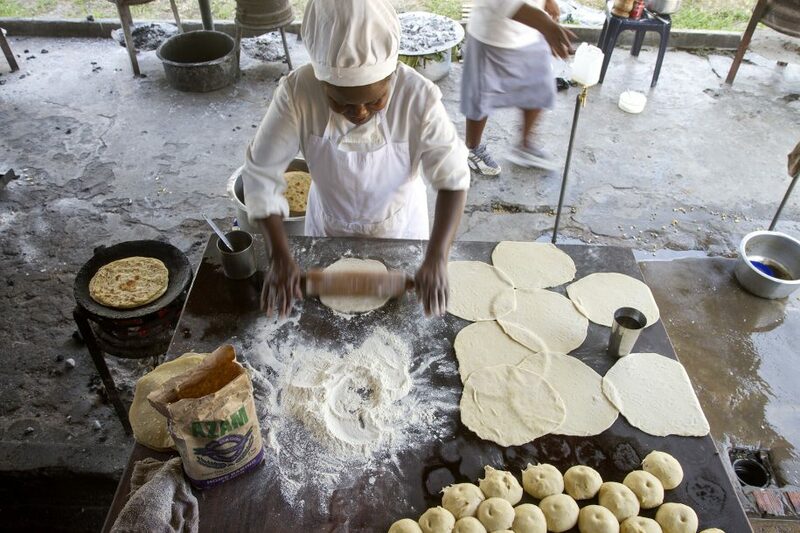 Now, I know how to make chapatis. I know how to cook rice, matoke, everything,” says Godfrey. Godfrey was studying to become a teacher like his father, but, unfortunately, the man who was helping him with the cost of school passed away. So, Godfrey started looking for work. He got a job as a waiter and then several cooking jobs at restaurants. 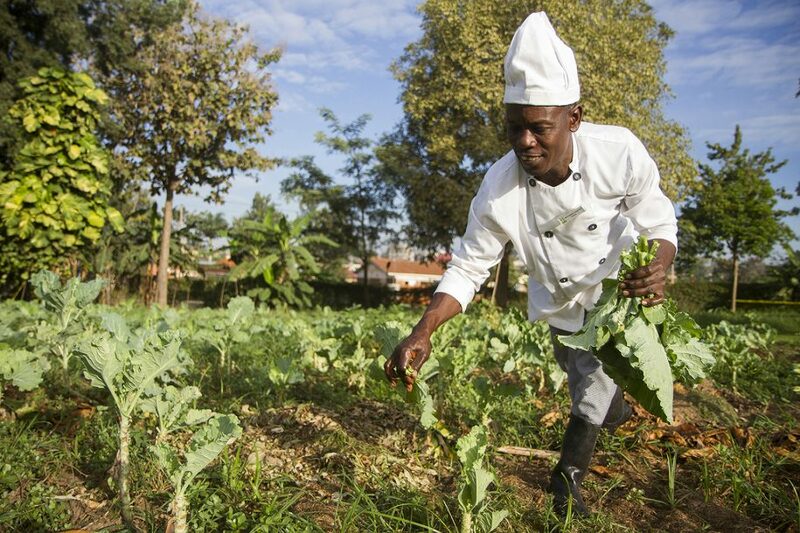 Godfrey picks vegetables in the hospital’s garden. Eventually, he was hired by CURE in 2011 as a member of the general service staff. Then in 2013, he switched positions and began working in the kitchen. Since then, Godfrey has learned to like all aspects of his job: cooking, cleaning, and serving. 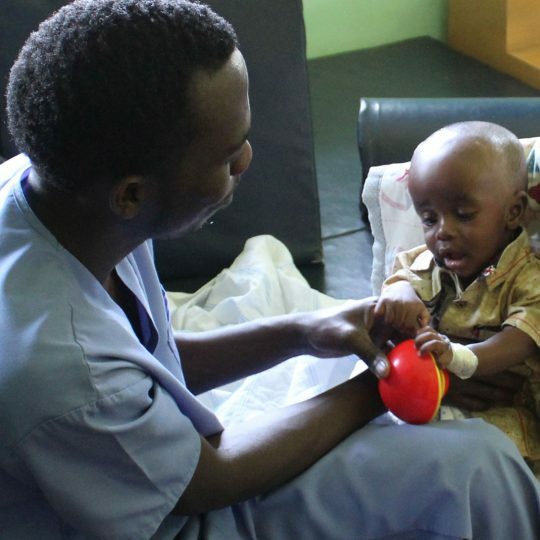 His position allows him to interact with the families at the hospital. 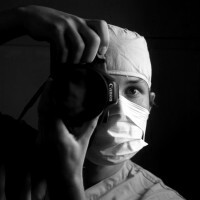 “The (children’s) caretakers, they fear when they have taken a child to O.R. [Operating Room]; you can get her when she is so scared and crying. ‘They have gone to treat, not to kill. You be here praying; the baby will be back,'” says Godfrey. 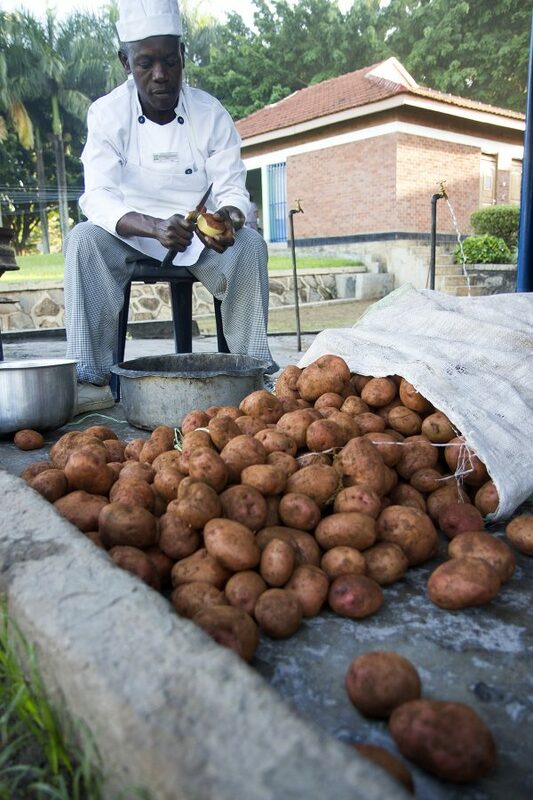 Godfrey sits as he peals potatoes. 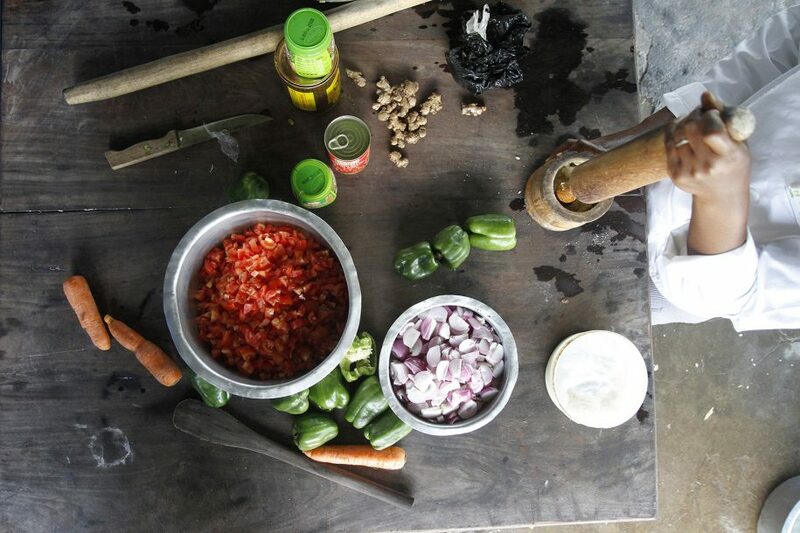 “I loved cooking when I was in secondary. I was taking home economics. I use to love cooking,” says Justine. In November 2001, Justine began working for CURE. As a cook, she found out about the position from her husband, who worked as a security guard. Justine smashes garlic on a table full of ingredients. “Every time, I say God bless the work of my hands when I’m going to work. Let whatever I prepare be delicious and be enough. One of the goals is not to hear any complaint about food. I make sure it is delicious, colorful, and enough,” says Rachel. It was not always Rachel’s dream to be a cook. “I wanted to become a police lady; that is what I wanted. I had two things: either a police lady or a nurse midwife. But the (degrees) were a bit expensive, especially nursing was expensive. For police, my parents discouraged me… So, I turned to catering just by the advise of my grandma, because she was a caterer. She advised me to go for catering, but at the same time, I was staying with a grandmother who was a nurse who was called Sister Margret. 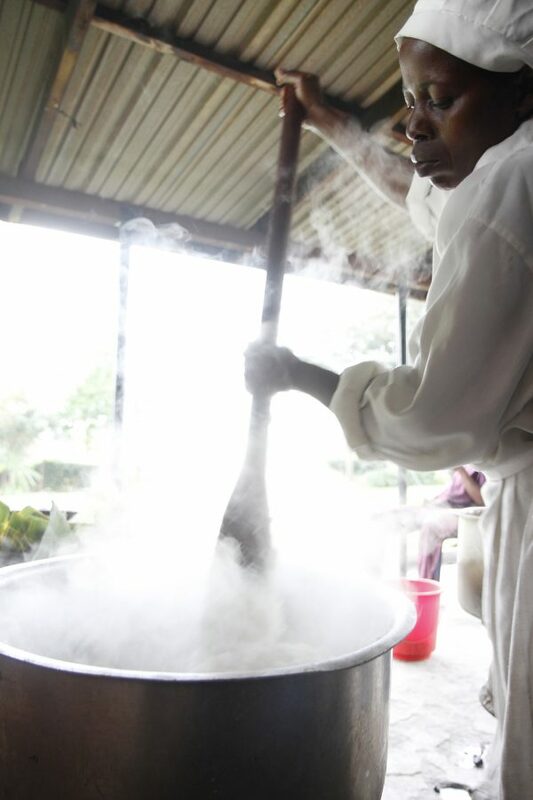 Margret, as much as she was nurse, she trained me how to cook,” says Rachel. Rachel followed the advice of her grandmother and studied for catering and hotel management. She worked in several hotels. 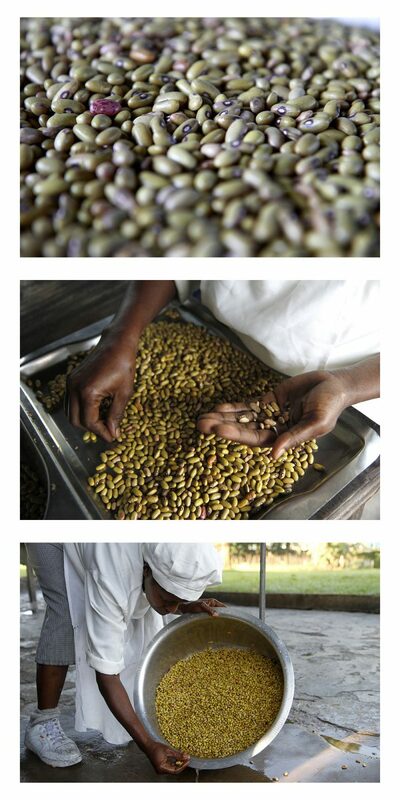 Then in 2007, Queen Elizabeth II visited Uganda, and Rachel was hired to prepare meals for Queen Elizabeth’s team. The following year, Rachel heard an advertisement for a head cook position at CURE. She was hired on July 14, 2008. Rachel enjoys cooking sauces, preparing the plates, and matching the colors of the food and different food groups. 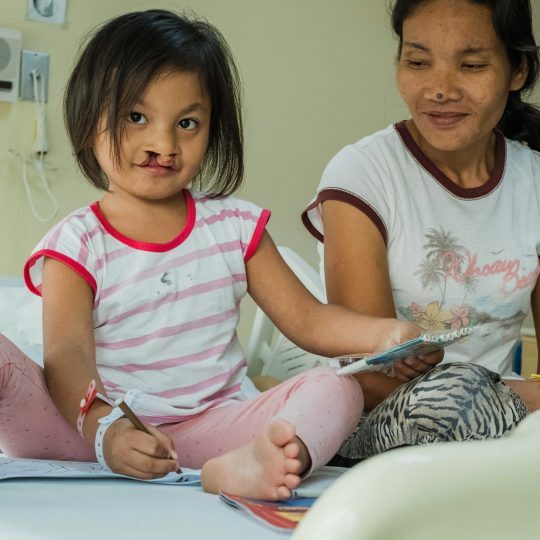 If a mother comes to the kitchen, Rachel uses the opportunity to use godly language when speaking with them, “I will always preach to them, comfort them if they are in sorrow,” says Rachel. 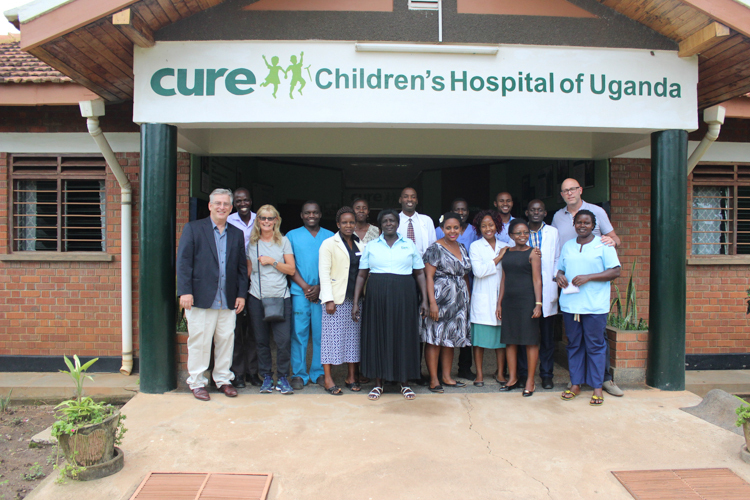 Aloha, I’m Christopher, the CURE Storyteller at CURE Uganda. My favorite thing in the world to do is make photographs, and I get to do that in a wonderful environment. On a normal day, I get to document surgeons, doctors, and nurses saving lives and families being prayed for and comforted by every department in the hospital. Prior to working for CURE, I spent the last two years working as a freelance photojournalist in Glenwood Springs, Colorado.